This is the countertop for the drink-fixing station at my local Starbucks - and without doing any research or substantiating this claim in any way, I think it's pretty obvious and clever why they chose it. Look at all those tiny spots in the pattern: coffee-colored brown and creamer-colored white. Exactly the kind of camouflage that would hide the many real drips of stray liquids, and make the constant mess there invisible to customers. Well played, Starbucks, well played indeed. Rolling out dough, despite being a favorite activity of toddlers, can be surprisingly challenging for adults just trying to make a pie that won't fall apart. 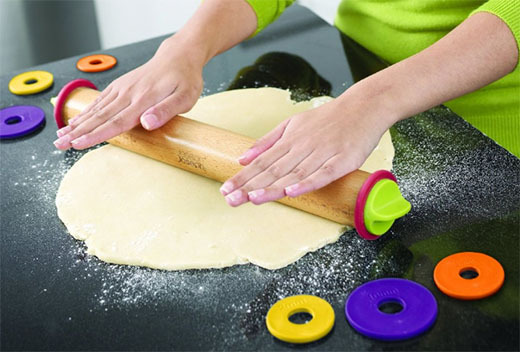 For those who don't trust their kitchen skills, Josesph Joseph has an innovative "Adjustable Rolling Pin": select side disks to set the thickness, then roll away worry-free. Normally I'd say something a little snarky here to wrap it up, but... darn it, this one seems pretty solid! Nice work, JJ. 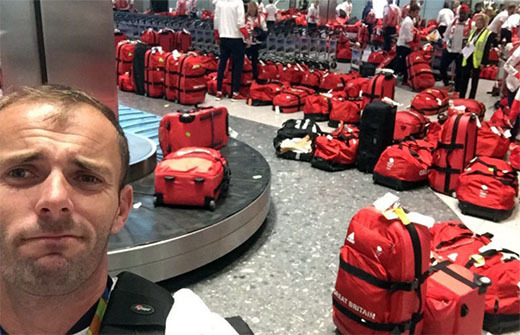 For all the things that could have gone wrong at the Rio Olympics, here's one that nobody expected: the patriotic efforts of Team Great Britain to provide its athletes with dapper matching luggage was perhaps a bit misguided. Windsurfer Nick Dempsey's photo - and expression - nicely sum up the problem. It's another instance of a design tradeoff I've mentioned before: uniformity is aesthetically pleasing, but differentiation is more usable!